Here’s something you might not know: when I was in high school, 15 years ago, a TI-83 cost about $100—pretty much the same as one costs today. Back then, it seemed like a pretty decent deal—my friends and I weren’t yet used to carrying around computers in our pockets. This post was inspired by a question that someone asked me on my Tumblr Q&A page. You can read the original question and response here. I imagine this is because many advanced math and science courses available in high schools these days either loan these machines to students, or recommend that students buy them. But I digress. 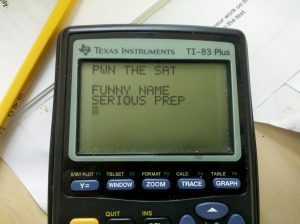 Chances are pretty good that your calculator, no matter how fancy, is on the College Board’s acceptable calculator list. Go ahead and check—I’ll wait. Is it on there? It is? Well, think for just a minute about what that means. 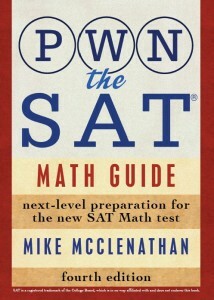 It means that the SAT folks don’t think your supercalculator gives you too much of an advantage, so you shouldn’t either. The feature I’m always hearing about that’s supposed to be a panacea for your SAT troubles is the “nSsolve” command. It’s a cool feature, admittedly, but the SAT doesn’t ask you to simply solve algebraic equations for one variable very often. Rather, you’ll be required to solve for one variable in terms of another, or figure out which two algebraic expressions are equivalent to each other using some simple set of rules (e.g., exponent rules, factoring the difference of two squares). In the past, I’ve noticed that students with calculators that can “solve” spend an inordinate amount of time trying to wrestle SAT algebra into a form that they can feed into their calculator to solve. If you find yourself doing that, then you’re using your calculator as a crutch, and you’re likely costing yourself precious time and points. If this describes you, try limiting your calculator use to simple arithmetic on your next practice test. Do all the algebra by hand. See what happens. You might be surprised. Use parentheses—It’s not your calculator’s fault if you enter “–2^2” instead of “(–2)^2” when you’re trying to square the value –2. If the calculator you have and are comfortable with is a TI-Nspire, then you should use it. Just don’t try to make every question into something you can shove into the “nSolve” function. If you don’t already have a calculator with all these bells and whistles, though, don’t get one just for the SAT. When I take the test—or work through a problem at my desk—I use a beat-up old TI-83 Plus (pictured below). It packs more than enough calculator punch for PWNing. Silly way to fail the pwnage.